At first glance the No. 45 and No. 55 may appear to be the same. A closer look will show that the No. 55 has a lot more parts. It has two fences, both right and left hand. The No. 45 has only one. The center sliding section has extra screws so that it can be adjusted up and down, and has a tower-like attachment at the front which functions as an additional skate that can also be adjusted. This feature of three skates, or bearing surfaces that move in relation to each other is the core of the difference between the two planes. 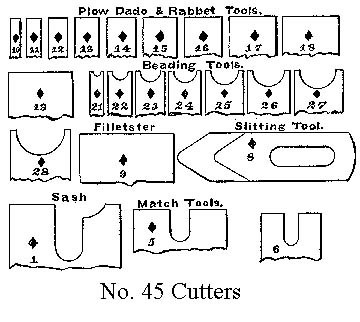 There are some exceptions to this breakdown of the cutters, based on the vintage of the plane. The No. 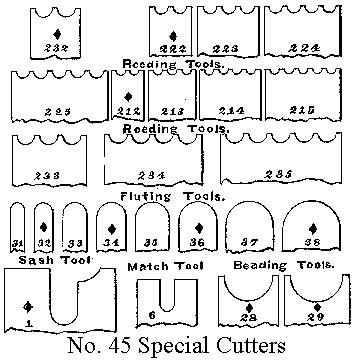 45 went from 18 to 22 cutters, adding the large beads and small match cutters over time. The set of No. 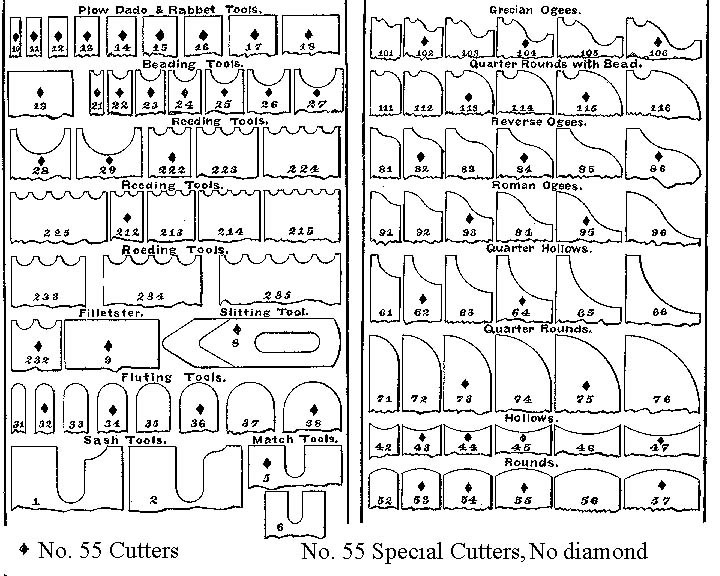 55 cutters basically stayed the same except for the later addition of a left and right hand chamfer cutter. The No. 45 came with one fence. 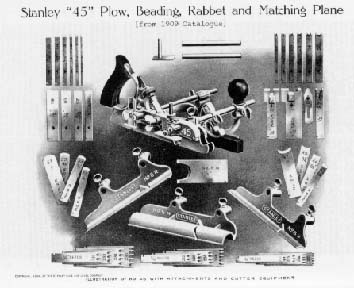 In 1895 a rosewood wear strip was added. In 1915, a Microdial screw was added for fine adjustment. The No. 55 came with both a right and left hand fence. Since they were first made around 1895, the rosewood wear strip was probably designed for the No. 55. As far as I know, the No. 55 always had the Microdial adjustment. On the No. 55, the rosewood strips rotate to facilitate making angle cuts. The fences on the No. 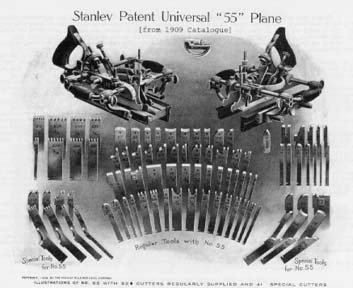 45 and 55 planes are not interchangeable. The rods on the two planes are different distances apart. For this reason, the No. 45 hollow and round bottoms will not fit on the No. 55. The hollow and round attachments work better than the cutters on the No. 55, because they have a sole and a throat, but the No. 55 will do the job if set properly and a fine cut is taken. Small accessories, such as the screws, cam, rods, and rear depth stop are interchangeable between the planes. I have used,and have seen the No. 55 being used successfully. Some people ( the wooden plane guys ) maintain that the No. 45 is a good tool, but the No. 55 is worthless compared to a wooden plane ... the problem being tearout of the wood being planed. I feel that care used in sharpening the cutter, setting up the tool, and choice of wood to plane can lead to a successful job.